Monsters from the netherworld of music bring about the dark symphony of the World Legacy story’s second act. (1) You can banish this card from the GY; Special Summon 1 “Orphegel” monster from your hand, except “Orphegel Canon Cannon”, but you cannot Special Summon monsters, except DARK monsters, for the rest of this turn. You can only activate the effect of this card’s name once per turn. (1) You can banish this card from your GY, then target 1 “Orphegel” monster in your GY, except “Orphegel Scherzo Skeleton”; Special Summon that monster, but you cannot Special Summon monsters, except DARK monsters for the rest of this turn. This card is named after Scherzo from music, and Skeleton. (1) You can banish this card from your GY; Special Summon 1 “Orphegel” monster from your Deck, except “Orphegel Divertimento Devil”, also you cannot Special Summon monsters for the rest of this turn, except DARK monsters. This card is named after Divertimento as well as Devil. (1) This linked card cannot be destroyed by battle. (2) You can target 1 of your banished Machine monsters; return that monster to the Deck, then you can Set 1 “Orphegel” Spell/Trap Card directly from your Deck to your side of the field. This card is named after Galatea, the classical “artificial woman come to life”. (1) This linked card cannot be destroyed by card effects. (2) You can target 2 of your banished Machine monsters; return those monsters to the Deck, then you can send 1 monster your opponent controls that this card points to to the GY, but this card cannot attack this turn. (1) While this card is linked, it cannot be destroyed by battle or card effects. 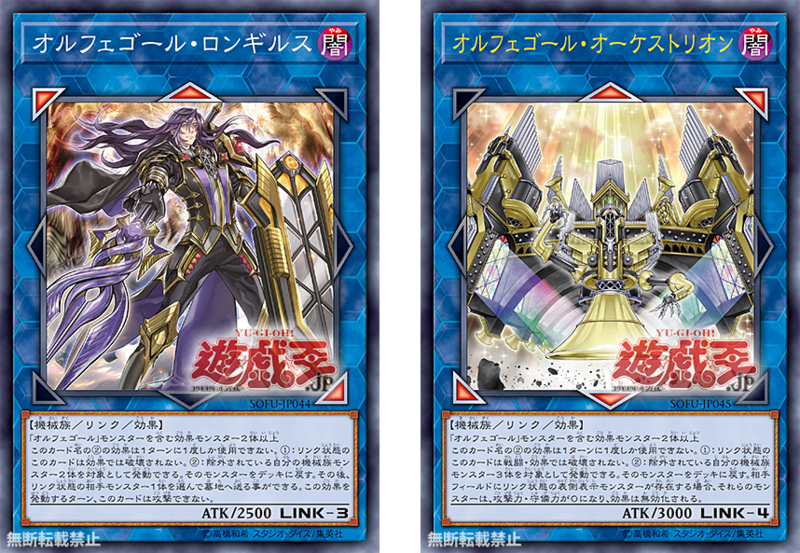 (2) You can target 3 of your banished Machine monsters; Return them to the Deck, also, if your opponent controls any face-up monsters that are linked, the ATK and DEF of those monsters becomes 0 and their effects are negated. This card is named after an Orchestrion. (1) When a monster declares an attack: You can Tribute 1 “Orphegel” or “World Legacy” monster you control, then target 1 monster your opponent controls; banish that monster. (1) Once per turn: You can banish 1 monster you control or in your GY, then target 1 “Orphegel” or “World Legacy” card you control, except “Orphegel Core”; that card cannot be targeted by effects for the rest of this turn. (2) If a “Orphegel” or “World Legacy” card you control, except this card, would be destroyed by battle or effect, you can send this card you control to the GY instead. Orpheus, the Greek figure who went to the underworld to reclaim his wife. In this case, Ningirsu trying to bring back his sister Ib from the dead after she seemingly killed herself to stop Lee from using her body with the Knightmares. Belphegor, the Demon Lord of Sloth who is connected with bringing laziness and the corruption of men through technology. And in the World Legacy setting, things that refer to music are basically always Bad Things (TM).